Foreign Direct Investment (FDI) is considered an essential factor of the global economic integration. They provide opportunities for gaining financial sustainability, stimulating economic growth and raising the level of welfare of people (OECD, 2008). However, there are also downside effects such as that FDI tends to crowd out local businesses. Although the magnitude of FDI inflows into emerging economies have increased significantly within the last decades, it was not sufficient to boost growth of those economies (Adams, 2009). For FDI to bring benefits for the recipient economies, the governments of those countries have to make efficient efforts for eliminating any bureaucratic impediments that can restrain the connections between international companies and their domestic counterparts. The government should also pay significant attention to the quality of institutions that attract investors from abroad (Rjoub et al., 2017). Classical and neo-classical economic growth theories state that the main drivers of production in any economy are physical capital, labour costs and the level of technological development that determines productivity of capital and labour. Emerging economies suffer from lack of capital, which restrains the volume of investment. Consequently, this inhibits economic growth, which can be replenished by inflows of capital from abroad. Within the last two decades, FDI has become an essential source of fulfilling capital needs in emerging economies (Allen and Aldred, 2013). Moreover, FDI is a considerable accelerator for economic growth in enhancing productivity of resources and well-being of population. On the other hand, beginning from the mid-1990s, the inflows of FDI from advanced to emerging economies intensified significantly. Therefore, emerging economies compete with each other for receiving foreign capital in the form of FDI (Hussain and Haque, 2016). One of the reasons why developing countries want to attract more FDI is that it can stimulate economic growth and employment in the recipient economy (Alfaro et al., 2010). Moreover, there are believed to be technological and know-how spill-overs that can help local businesses to become more competitive as well (Borensztein et al., 1998). There are several channels through which FDI can bring positive changes in the economy of the host country if benevolent host-country regulations and the initial level of development is provided (OECD 2002). FDI stimulates the distribution of innovative technologies and know-how in the host county; it stimulates rivalry in the local market thus increasing the quality of products and services; it enhances human capital by raising skills of the labour force and distributing technical, managerial and marketing knowledge; it embeds the host economy in the global economy by synchronising regulatory and legal frameworks; finally, it stimulates domestic companies to adopt international business standards and improve quality of management (Margeirsson, 2015). On the other hand, the effect of FDI on the host economy is not limited to only positive impacts. Moura and Forte (2009) argued that along with positive effects, several negative consequences of FDI attraction can be observed. The authors argued that the first four impacts of FDI that were proposed to be positive in OECD (2002) could also have negative effects. Besides, FDI might negatively influence the adoption of local regulatory acts. One more interesting effect was underlined by Mencinger (2003). The author revealed that capital received from international sources may be directed at imports instead of being invested in the host economy. As a result, the balance of payments may suffer, which, according to the Thirlwall Law, might have a negative influence on economic growth in the long run (Britto, 2008). One can see that there is no common consensus on the role of FDI in the global economy and particular effects of FDI on economic growth of the recipient countries. Moreover, this effect might be different depending on the initial level of economic development, quality of institutions and regulatory terms. Therefore, it is important to shed light on the relationship between FDI and economic growth in different developing regions in the world. Moreover, it is significant to understand whether additional factors such as openness of the economy, use of natural resources, human capital, employment rate and investment in physical assets also contribute to economic growth. This research makes a contribution to available literature by providing the most recent evidence for two major regions, namely Latin American countries and South East Asian countries. As conditions of the use of FDI may be different across regions, the sample analysed in this study is comprised of 10 emerging economies where five countries are from Latin America and five countries are from the South East Asia. A separate analysis of these two sub-samples is also conducted. The results are compared between these two regions and contrasted to the findings for the entire sample. This allows for indicating specifics of the use of FDI and the influence of additional factors on growth in different regions. - To assess the influence of FDI on economic growth in the South-East Asian countries. The rest of the dissertation is structured as follows. Chapter 2 reviews literature on FDI. Chapter 3 discusses the methodology of the study. Chapter 4 provides results and discussion. Chapter 5 makes conclusions and states limitations and recommendations of the research. A number of empirical studies exposed that the association between FDI and economic growth can be mediated by additional factors such as the level of institutional development in the host country (Bengoa and Sanchez-Robles, 2003), maturity of financial markets (Alfaro et al., 2004), technological difference between domestic firms and international companies (Li and Liu, 2005), variety of export items (Nicet-Chenaf and Rougier, 2009) and flows of imports and exports (Fitzova and Zidek, 2015). A number of previous papers that explored the association between FDI inflows and economic growth suffered from some methodological restrictions that may have influenced the relevance and reliability of the outcomes of analysis. Numerous econometric models were constructed for examining the impact of FDI on growth rate of GDP in emerging economies. However, only a few of them tested the causal links between these variables. Some authors attempted to apply the Engle-Granger cointegration test or maximum likelihood test for establishing the direction of causation. However, Johansen (2002) argued that these procedures were less applicable for small samples. Following this logic, Odhiambo (2009) used the bounds testing cointegration procedure suggested by Pesaran et al. (2001), which provided more robust outcomes. Mawugnon and Qiang (2017) also explored the causal association between FDI and growth in Togo during the period 1991-2009 by means of the Granger-causality test. The researchers revealed the presence of a unilateral connection between these variables. The finding was that FDI caused economic growth in Togo. Thus, the endogeneity problem was resolved. A practical recommendation of the study was to enhance the investment climate for capital flows from abroad in order to raise the level of competitiveness of the economy. At the same time, country-specific differences of FDI effects on the economy were not exhibited in the analysis of cross-sectional data (Ghirmay et al., 2001). It is noteworthy that the majority of scholars tried to explore data for longer time intervals in order to attain more relevant outcomes less subject to the influence of short-term economic volatility and crises (Blomkvist, 2011, Angelopoulou and Liargovas, 2014). A positive and significant relationship between FDI and economic growth was indicted by Simionescu (2016) in a study exploring the sample of the countries of the European Union (U-28) during the period 2008-2014. A panel vector autoregression (VAR) model was employed along with Bayesian techniques, which allowed for estimating this effect for particular economies in the sample. While the association between FDI and economic growth was positive for the majority of the EU countries, there were also economies in which this relationship appeared to be insignificant. This implies that the attraction of FDI inflows did not lead to growth and increase in GDP everywhere. The outcomes of the cluster analysis revealed that disparities of FDI allocation that were present in 2008 almost diminished by 2014, which means that the flows of FDI in the European countries became more homogenous. The author made a conclusion that, in general, there was a bilateral relationship between GDP growth and inflows of FDI in the EU economies by the beginning of the world economic crisis but with some cross-country differences. Further, these differences almost disappeared by 2014. According to Margeirsson (2015), attraction of FDI in the recipient economy does necessarily not lead to positive consequences. Blomström et al. (1992) and Beugelsdijk (2008) exposed that the effect of FDI inflows on richer economies was stronger than in poorer countries. This finding is in line with the Eclectic Paradigm of FDI, according to which location factors are a significant determinant of the effects of FDI. In line with that, Alfaro et al (2010) and Choong (2012) revealed the relationships between the efficiency of FDI use and the level of development of financial markets in the recipient economies. That is, more advantages of FDI inflows could be observed in countries where the financial system had a higher level of development. These findings might partially shed light on the outcomes of Blomström et al (1992) since more developed economies usually have advanced financial systems. Finally, Gallagher and Zarsky (2006) argued that the poorer the country, the higher the probability that the overall effect of FDI would be negative. In particular, Borensztein et al. (1998) demonstrated that the negative influence of FDI growth was more evident in the economies that had a lower level of human capital. Hussain and Haque (2016) evidenced the presence of significant linear relationship between FDI, trade openness and rate of economic growth represented by the per capita GDP, in Bangladesh. Similar to Simionescu (2016) and Mawugnon and Qiang (2017), the authors employed the VECM framework to estimate long-term relationships between the variables during the period 1973-2014. Several diagnostic tests were conducted after running the regression analysis in order to ensure the robustness of results and validity of the applied empirical model. The tests included examination of normal distribution of the data and autocorrelation test. In particular, trade and FDI were shown to have a substantial effect on economic growth. These results implied that FDI and international trade were important drivers of economic growth in Bangladesh. Therefore, the authors recommended that the regulatory framework should be improved in order to reduce or diminish barriers for international trade and capital inflows in the country. In turn, Jacobs (2001) suggested three ways in which FDI could influence economic growth. First, attraction of capital from abroad in the form of FDI could affect growth through the balance of trade channel as the pattern of imports and exports would change. It was also noticed that FDI stimulated more domestic investments rather than consumption (World Bank, 2002). Moreover, FDI normally have lower volatility than other types of finance (Cobham, 2002). This is especially evident during the financial turmoil when foreign firms were not inclined to get rid of their subsidiaries immediately while banks attempted to significantly reduce short-term lending. On the other hand, financial turmoil may cause a significant reduction in new flows of FDI. Therefore, central banks in emerging economies should accumulate foreign exchange reserves in advance in times of growth to have opportunities for mitigating harmful effects of crises. Another benefit of FDI is that foreign companies accept potential investment risks since the host economy is not interested in failing investment projects. On the other hand, profit in foreign currency might not be received in case the products of international companies are mostly sold in the local market rather than exported overseas (Lipsey, 2001). Secondly, FDI influences economic growth through the channel of the labour market. International companies can create jobs for population in both rural and urban regions of the recipient country (Jacobs, 2001). When jobs are created, unemployment falls and the economy operates at the level closer to the level of full employment. Thus, the actual output would be closer to the potential output (Watkins, 1998). When prosperity of the population increases, people are more inclined to consume more. Thus, economic growth will be reinforced through increased consumption. Thirdly, FDI can affect economic growth through the channel of knowledge spill-over (Margeirsson, 2015). FDI facilitates the transfer of technologies and managerial expertise from international companies to the companies of the host country. This will make industries more competitive and efficient. As a result, total output should increase (Jacobs, 2001). The practices of this knowledge transfer are training of the personnel and stimulation of rivalry within sectors where foreign companies perform. Multinational companies that come with FDI also help to strengthen forward and backward linkages with adjacent industries when these companies sell their production to local firms or use local companies as suppliers (Sinclair, 2010). The study of Sghaier and Abida (2013) showed a strong positive association between FDI and economic growth for a sample of four North African countries, including Algeria, Egypt, Morocco and Tunisia. The research covered the period 1980-2011 and employed the Generalized Method of Moment (GMM) as the main analytical method. Similar to Alfaro et al (2010) and Choong (2012), the authors demonstrated that the development of the local financial system served a significant precondition for turning FDI into a source of economic growth. Therefore, it can be concluded, based on the reviewed literature, that FDI can positively affect economic growth through various channels but this effect is not unconditional. It is determined by the quality of institutions in the country, regulation and development of the financial system. This dissertation employs secondary quantitative data sample for a sample of 10 emerging economies. There are five countries from Latin America, namely Argentina, Brazil, Chile, Uruguay and Venezuela. There are also five countries from South East Asia including Indonesia, Malaysia, Philippines, Thailand and Vietnam. The period of analysis is 1990-2016. The data is retrieved from the World Development Indicators (World Bank, 2017). GDP growth represents economic growth and is employed as the dependent variable. Independent variables whose effect on economic growth is explored in this study include net FDI inflows, trade openness calculated as the sum of imports and exports as percentage of GDP, employment rate (%), growth in labour force (%), human capital represented by the secondary school enrolment rate, and total natural resources rent as a percentage of GDP. First, the relationships between the variables for the whole sample are estimated. Then, the sample is divided into two sub-samples representing Latin America and South-East Asia. This is done in order to assess the regional differences in the effect of FDI on economic growth in the context of emerging economies. H01: FDI does not have a significant impact on economic growth in emerging economies. 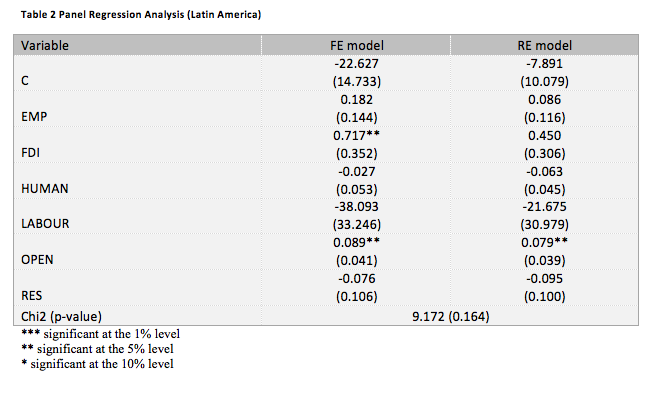 H02: The effect of FDI on economic growth in the Latin American countries is not statistically significant. H03: The effect of FDI on economic growth in the economies of the South-East Asian region is not statistically significant. These hypotheses are tested using the method of panel regression analysis. The panel regression analysis allows for assessing the statistical significance of the relationships between the variables during the whole period of analysis by means of assessing the t-statistic of the estimated coefficients. The panel regression analysis is applied because the data in the sample has two dimensions, namely cross-sections and time-series. Cross-sections are represented by countries while time-series are represented by changes of the variables in a specific time frame. Since there could be cross-country differences that cannot be taken into account by the chosen independent variables, the pooled ordinary least squares (OLS) regression may not be the most appropriate in this case. The issue of country-specific differences is addressed by employing the fixed and random effects in the panel regressions. In both fixed and random effect models, there is an assumption that there are some effects on the dependent variable that cannot be explained by the independent variables. When fixed effects (FE) are used, a special dummy variable that reflects these unrecorded effects is appointed for each cross-section and is supposed to stay constant within the entire period of analysis. Meanwhile, in the random effects (RE) model, there is one variable that accounts for unrecorded impacts on the dependent variable for all cross-sections but this variable is modelled as a stochastic variable with its own error term. This means that along with the error term in the model that accounts for recorded effects of the included variables, another error term is added which accounts for unrecorded effects. The Hausman specification test is conducted to decide which type of the effects is more appropriate for the analysis of the sample. The null hypothesis of the test is that the RE-model should be applied while the alternative hypothesis is that the use of the FE-model is more appropriate. The p-value of the chi2 is estimated and compared with the 5% significance level. If the p-value is higher than 0.05, this means that the value of the test lies inside the confidence interval and the null hypothesis of the test should be accepted. On the other hand, if the p-value is lower than 0.05, the null hypothesis is rejected and the alternative hypothesis that the FE-model should be used is accepted. where for country i and year t, GDP is growth rate of real GDP; FDI is natural logarithm of foreign direct investments; Open is trade openness of the economy represented by the sum of imports and exports as % of GDP; Emp is the rate of employment; Labour is the growth rate of the labour force; Human is human capital represented by the secondary school enrolment rate; Res is rent from the use of natural resources as % of GDP; is the intercept, are slope coefficients; is the error term. The panel regression analysis is run for three samples. The first is the full sample including all ten countries explored in the analysis while the two other sub-samples include countries from only one region, either Latin America or South-East Asia. After conducting the regression analysis, the Hausman test is applied to each model to determine which type of effects is more appropriate. The outcomes of the analysis for the full sample are exhibited in Table 1. 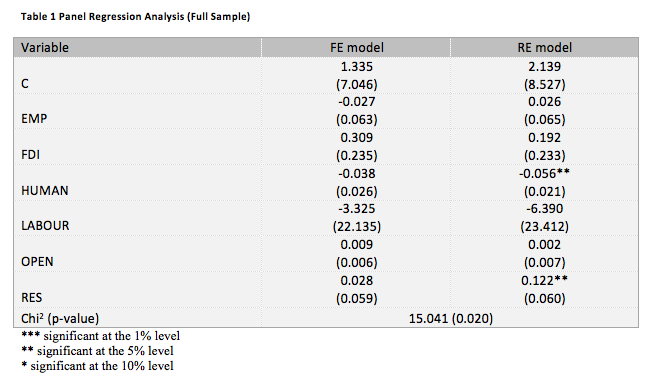 One can see that no significant coefficients can be observed in the FE-model. At the same time, the effect of employment rate, growth in labour force, FDI and trade openness do not have a significant effect on economic growth in the RE model. However, there is a significant positive linear association between the rent on natural resources and economic growth in the developing countries. This confirms the assumption that developing countries with rich natural resources tend to have less diversified economies and the main national income is derived from these resources. In contrast to expectations, human capital was found to produce a statistically significant negative effect on economic growth at the 5% significance level. This discrepancy with expectations can be explained by the quality of the proxy for human capital. The secondary school enrolment was found to be a rather poor indicator of human capital and future studies should focus on other alternative such as R&D expenditures. The p-value of the Hausman test is equal 0.020. This value is lower than 0.05. This means the null hypothesis of the test cannot be accepted and therefore the FE model is preferred. Thus, even though this model does not provide statistically significant results, it also does not show any contradictions with the economic theory or expectations. Thus, no significant coefficients are contained in the FE-model. This means that none of the explanatory variables has a significant effect on economic growth for the sample of ten emerging economies but a question arises that there could be regional differences. These differences are explored in the next sections of the analysis. The regional differences are explored by running separate regressions for Latin American and South-East Asian countries. The outcomes results for Latin American countries are provided in Table 2. FDI and openness of the economy were found to have a significant positive impact on economic growth in the model with FE. At the same time, employment, human capital, labour force and natural resources rent did not have a significant influence on the dependent variable. These findings are different from the regression for the full sample, which indicates the presence of regional differences. The analysis of the model with RE shows that only trade openness has a statistically significant positive effect on economic growth in Latin America. In contrast to expectations, FDI was not found to produce a significant effect whereas other independent variables, except for trade openness, also shown no effect on economic growth in the RE model. Trade openness was a significant predictor of economic growth in both models. In fact, the Hausman test is used to test whether the coefficients produced by the RE model are consistent. The p-value of the test is equal 0.164. This is above the 5% level. This means that the null hypothesis of the test has been confirmed, and thus the RE-model produced more efficient and consistent coefficients than the FE model. This means that there is no strong evidence that FDI produced a significant positive impact on economic growth in Latin America. Table 3 provides the results for the South East Asian region. Examination of the FE-model shows that employment rate, FDI, human capital, increase in labour force, and trade openness do not have a significant effect on economic growth while only natural resources rent has a significant positive correlation with the GDP growth. As for the model with RE, human capital and the natural resources rent produce a statistically significant effect on the economic growth at the 5% level, and FDI is significant only at the 10% level. FDI are positively associated with the GDP growth. The same relationship holds between the natural resources rent and economic growth. The secondary school enrolment rate is found to be negatively associated with the economic growth, which is inconsistent with original expectations and the endogenous growth theory. The p-value of the chi2 of the Hausman test is equal 0.052. This value is higher than 0.05, which means that the null hypothesis of the test can be accepted. This implies that the RE-model is more appropriate for the sample of the South-East Asian countries. Thus, there is slight evidence at the 10% significance level that FDI could make a positive contribution to economic growth in this region. The results of this dissertation have not supported previous research conducted by Nistor (2015) and Asongu (2015) who found the effect of FDI inflows on economic growth to be significant in developing countries. However, Nistor (2015) found this effect to be positive whereas Asongu (2015) argued that the effect was negative at least for BRICS and MINT countries. The result of the current study contradicts to the findings of both researchers as it showed that there was not enough evidence to consider the effect of FDI inflows on economic growth to be significant. This also is not line with the conclusions of Simionescu (2016) who demonstrated a positive and significant relationship between FDI and GDP growth in emerging economies. As for region-specific research, the current findings are in line with those provided by Alvarado et al. (2017) for a broader sample of 19 economies of Latin American countries. However, previous research conducted by Al Nasser (2010) showed the effect of FDI on economic growth to be significant. This distinction in findings may be explained by different methods employed, time period investigated and composition of the sample. Macroeconomic conditions might have changed in the recent years so that the effect of FDI on economic growth could also change. Despite the differences in the methodology of this dissertation and previous research conducted by Goh et al. (2017), both studies showed that the effect of FDI on the economies of the South-East Asian countries was insignificant. Nevertheless, previous research on the Asian region conducted by Wei (2010) showed a significant relationship between FDI and GDP growth, which was not fully supported by this dissertation based on the conventional 5% significance level. The aim of the study was to explore the effect of FDI on economic growth in emerging economies of Latin America and South-East Asia. Quantitative research using methods of statistical analysis was employed for attaining this aim. The country-level data capturing the period 1990-2016 was used in the study. The source of the data is the World Bank. Three samples were used for the analysis. The first one was the full sample including ten emerging economies. The other two samples were comprised of countries from different regions, namely Latin America and South East Asia. A panel regression analysis was used as the main analytical method. Along with that, the Hausman specification test was applied to determine which type of model was more appropriate for explanation of the data. The results of the analysis report that the FE-model was more appropriate for the analysis of the full sample whereas the RE-model was more useful for the exploration of the two sub-samples. 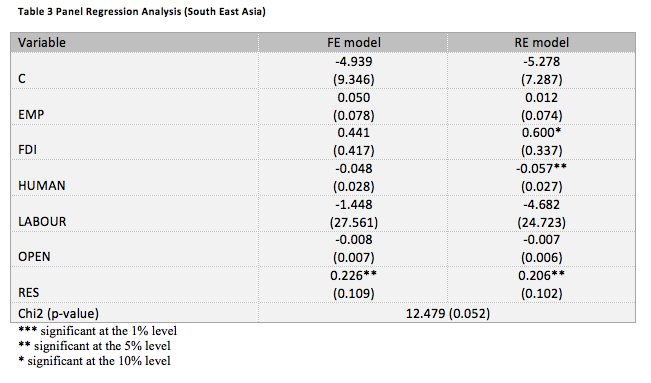 The FE-model used for the analysis of the full sample showed no significant effect of FDI on economic growth. Meanwhile, trade openness was shown to have a significant effect on growth in Latin American economies. The effect was positive, which was consistent with expectations. The explanation of this relationship is that trade stimulates production and exports. As for the South-East Asian economies, the results also revealed no significant effect of FDI on the growth rate of the economies. However, the effect was positive and only significant at the 10% level, which was not enough to reject the null hypothesis. At the same time, a phenomenon was found that economic growth in some of the emerging economies greatly depended on natural resources. If their economies are not diversified sufficiently, this could effectively lead to the resource curse. Thus, all three null hypotheses were accepted by this study. In particular, they stated that no significant relationship between FDI and economic growth existed in the emerging economies, even on the regional level. The first limitation of the study is the presence of missing values for some years and countries within the explored period. Even though the World Bank database is one of the most complete sources of macroeconomic data, it still produces missing values that cannot be replaced. The lack of some pieces of data might to some extent distort the values of regression coefficients. Yet, it is unlikely that the significance of the influence of the independent variables on economic growth was greatly affected by this factor. Another limitation of this research is that it did not take in to account potential structural breaks in data. In particular, the global financial crisis of 2007-09 significantly affected macroeconomic conditions in the world economy with consequent administrative measures from the governments directed at preventing the recurrence of the crisis. This all influenced the conditions of growth and could potentially shift the relationship between FDI and GDP growth rates. This problem, as well as potential endogeneity issues, needs to be considered in more detail in future studies. One of the recommendations that can be made to future researchers is to enhance the sample that would include more regions. There are several emerging regions in the world such as Latin America, Asia, the Arab World, Africa, and Eastern European countries. The choice of economies from only two of those regions made the sample less balanced. Thus, two ways of enhancing the sample can be offered. First, each developing region could be investigated separately to indicate region-specific determinants of growth. A separate exploration of Latin American and South-East Asian economies showed that there were distinct determinants of growth in each region. Another option is to explore all emerging economies in the world and thus confirm a general relationship between FDI and economic growth. This would also allow for increasing the sample size and, assuming the asymptotic characteristics of the t-test measuring the statistical significance, this may lead to more convincing results. In this dissertation, this lack of observations could have been the reason why FDI could not be fully considered a significant predictor of economic growth at the conventional 5% level. Another recommendation for future researchers is to improve specification of the model by adding other determinants of growth and better proxies for the labour market and human capital. As the literature review showed, the effect of FDI on the economic growth could be preconditioned by political and regulatory factors, institutional factors and the quality of the financial system. At the same time, there is significant criticism of GDP as the main variable representing growth. In particular, GDP is often criticised for not considering negative externalities that reduce well-being of the society. This measure of economic growth is also criticised for not putting sufficient emphasis on intangible constituents of growth such as research and development expenditures. Only recently, the US decided to change the methodology of estimating the country’s GDP to reflect R&D more adequately (The Economist, 2016; Constanza et al., 2009). Finally, future researchers can be recommended to use more advanced analytical procedures to capture the effects of FDI on economic growth. For example, the vector autoregression analysis is more able to account for lagged effects of FDI on GDP and it can also resolve endogeneity issues. The Granger Causality Test and the Block Exogeneity Test could be used in the future to detect whether there is a feedback from GDP to FDI inflows. Adams, S. (2009) Foreign Direct Investment, Domestic Investment, and Economic Growth in Sub-Saharan Africa, Journal of Policy Modelling, 31, pp. 939-949.
markets, Journal of International Economics, 64 (1), pp. 89–112. Alfaro, L., Chanda, A., Kalemli-Ozcan, S. and Sayek, S. (2010) Does foreign direct investment promote growth? Exploring the role of financial markets on linkages, Journal of Development Economics, 91, pp. 242-256. Allen, M.M.C. and Aldred, M.L. (2013) Business regulation, inward foreign direct investment, and economic growth in the new European Union member states. Critical Perspectives of International Business, 9, pp. 301–321. Al Nasser, M. (2010) How Does Foreign Direct Investment Affect Economic Growth? The Role of Local Conditions, Latin American Business Review, 11, pp. 111-139. Alvarado, R., Iniguez, M. and Ponce, P. (2017) Foreign direct investment and economic growth in Latin America, Economic Analysis and Policy, 56, pp. 176-187. Angelopoulou, A. and Liargovas, P. (2014) Foreign Direct Investment and Growth: EU, EMU and Transition Economies, Journal of Economic Integration, 29 (3), pp. 470–495. Asongu, S. (2015) Drivers of Growth in Fast Emerging Economies: A Dynamic Instrumental Quantile Approach, African Governance and Development Institute Working Paper WP/15/009. evidence from Latin America, European Journal of Political Economy, 19 (3), pp. 529–545. Beugelsdijk, S., Smeets, R. and Zwinkels, R. (2008) The impact of horizontal and vertical FDI on host's country economic growth, International Business Review, 17, pp. 452-472. Blomkvist, K. (2011) The impact of a common EU FDI approach on individual member states and overall EU competitiveness. In Proceedings of the 13th Annual SNEE European Integration Conference, 17-20 May, Grand Hotel, Mölle, Sweden: SNEE Press, pp. 2–22. Blomström, M.,Lipsey, R. E. and Zejan, M. (1992) What Explains Developing Country Growth? NBER Working Paper Series, 4132. Borensztein, E., De Gregorio, J. and Lee, J. W. (1998) How does foreign direct investment affect economic growth? Journal of International Economics, 45, pp. 115-135. Britto, G. (2008) Thirlwall’s Law and the Long-Term Equilibrium Growth Rate: an Application for Brazil (1951-2006), University of Cambridge, Cambridge Centre for Economic and Public Policy CCEPP WP01-08. Choong, C.-K. (2012) Does domestic financial development enhance the linkages between foreign direct investment and economic growth? Empirical Economics, 42, pp. 819-834. Cobham, A. (2002) Capital Account Liberalization and Impacts on the Poor, Global Social Policy, 2 (2), pp. 34-49. Costanza, R., Hart, M., Posner, S. and Talberth, J. (2009) Beyond GDP: The Need for New Measures of Progress, THE Pardee Papers, 4.
and Slovak Republics, Economics and Sociology, 8 (2), pp. 36–50. Gallagher, K. P. and Zarsky, L. (2006) Rethinking Foreign Investment for Development, Post-Autistic Economics Review, 37, pp. 212-224. Ghirmay, T., Grabowski, R., Sharma, S. C. (2001) Exports, investment, efficiency and economic growth in LDCs: an empirical investigation, Applied Economics, 33 (6), pp. 689–700. Hussain, M. E. and Haque, M. (2016) Growth: An Empirical Analysis of Bangladesh, Economies, 4 (7), pp. 3-17. Jacobs, D. (2001). The Potential and Limitations of Foreign Direct Investment for Development, Financing for Development conference documents. Johansen, S. (2002) A Small Sample Correction for the Test of Cointegrating Rank in the Vector Autoregressive Model, Econometrica, 70 (5), pp. 1929-1961. Li, X., Liu, X. (2005) Foreign direct investment and economic growth: an increasingly endogenous relationship, World Development, 93 (3), pp. 393–407. Lipsey, R. E. (2001) Foreign Direct Investors in Three Financial Crises. NBER Working Paper No 8084. Margeirsson, O. (2015) Foreign Direct Investment: A Focused Literature Review, Binzagr Institute for Sustainable Prosperity Working Paper No. 104. Mawugnon, A. K. and Qiang, F. (2017) The Relationship Between Foreign Direct Investment and Economic Growth in Togo [1991-2009], Proceedings of the 8th International Conference on Innovation & Management, pp. 1269-1273. Mencinger, J. (2003) Does Foreign Direct Investment Always Enhance Economic Growth? Kyklos, 56, pp. 491-508. Nicet-Chenaf, D. and Rougier, E. (2009) FDI and growth: A new look at a still puzzling issue, Groupe de Recherche en Economie Théorique et Appliquée, 5113, (13), pp. 1–26. Nistor, P. (2015) FDI Implications on BRICS Economy Growth, Procedia Economics and Finance, 32, pp. 981-985. Odhiambo, N. M. (2009) Energy consumption and economic growth in Tanzania: an ARDL bounds testing approach, Energy Policy, 37 (2), pp. 617–622. OECD (2002) Foreign Direct Investment for Development. Paris: Organisation for Economic Co-operation and Development. OECD (2008) Benchmark Definition of Foreign Direct Investment, Available at: http://www.oecd.org/investment/fdibenchmarkdefinition.htm [Accessed 03/10/2017]. Pesaran, M. H., Shin, Y., Smith, R. J. (2001) Bounds testing approaches to the analysis of level relationship, Journal of Applied Economics, 16 (3), pp. 289–326. Rjoub, H., Aga, M., Oppong, C., Sunju, N. and Fofack, A. (2017) The impact of FDI inflows on economic growth: Evidence from landlocked countries in Subsaharan Africa, Journal of Social Sciences, 10 (1), pp. 153-168. Sakuragawa, M. and Watanabe, Y. (2009) Foreign Direct and Portfolio Investments in the World Working paper, Keio University, Available at: https://www1.gsec.keio.ac.jp/imgdata/working/30_pdf.pdf, [Accessed on 03/10/2017]. Samad, A. (2009) Does FDI Cause Economic Growth? Evidence from South-East Asia and Latin America, Woodbury School of Business Working Paper 1-09. Sghaier, I. M. and Abida, Z. (2013) Foreign Direct Investment, Financial Development and Economic Growth: Empirical Evidence from North African Countries, Journal of International and Global Economic Studies, 6 (1), pp. 1-13. Simionescu, M. (2016) The relation between economic growth and foreign direct investment during the economic crisis in the European Union, Zbornik Radova Ekonomskog Fakulteta u Rijeci, 34 (1), pp. 187-213. Sinclair, R. H. (2010) Impact of Foreign Direct Investment on the Development of an Emerging Economy: The Case of China, School of Doctoral Studies European Union Journal, 2, pp. 6-39. The Economist (2016) The Trouble with GDP, Available at: https://www.economist.com/news/briefing/21697845-gross-domestic-product-gdp-increasingly-poor-measure-prosperity-it-not-even, [Accessed on 03/10/2017]. Watkins, Kevin. (1998) Economic Growth with Equity: Lessons from East Asia, Oxford: Oxfam Publications. Wei, H. (2010) Foreign direct investment and economic development in china and East Asia, The University of Birmingham Working Paper. World Bank (2001) Global Development Finance: Financing the Poorest Countries, Washington: World Bank.